Before the shootings at Sandy Hook Elementary and Virginia Tech—and the other dozen-plus school shootings in the past decade—there was Columbine. The 1999 shooting that took the lives of 12 students at Colorado’s Columbine High School left a big impression on Bruce Walther, now a fourth-grade teacher in the Uintah School District. Walther joined more than 150 educators who attended a free concealed-carry weapons class held in a conference room of the Maverik Center, put on by Clark Aposhian, chair of the Utah Shooting Sports Council. Bus drivers, hall monitors, receptionists and teachers—some who had traveled from Utah County, Park City and even St. George—packed the conference room. All who were eligible received conceal-carry permits at the end of the course. 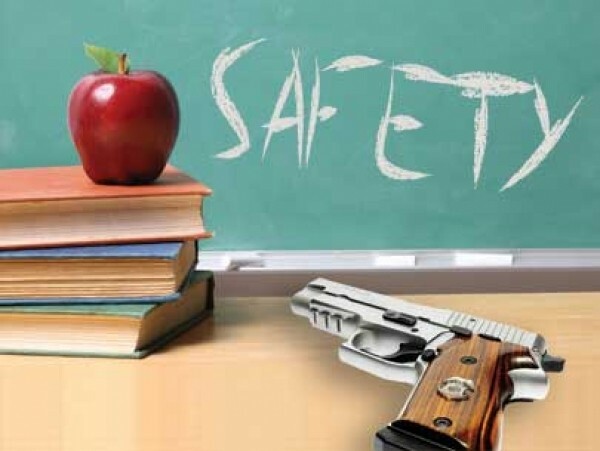 At the training, both the nervous, gray-haired schoolteachers still wearing their Christmas sweaters and the young-and-ready teachers like Walther learned some new options for a worst-case scenario. Instructors at the event emphasized repeatedly that their objective wasn’t to put a gun in the hands of everyone in attendance, but to offer education. “You know better than I do that education is always better than ignorance,” Aposhian told the class. But the idea of armed teachers is one that gun-control advocates have been widely critical of. On Dec. 20, 2012, the presidents of the nation’s largest teachers unions, the National Education Association and the American Federation of Teachers, released a statement lambasting gun-rights groups advocating for more armed teachers. The statement criticized the idea that more guns in schools will help reduce shootings, saying they would likely instead lead to more violence. The statement noted the larger concern missed in the debate is an estimated $4.35 billion cut from states’ public mental-health funding in the past five years. “Greater access to mental-health services, bullying prevention and meaningful action on gun control—this is where we need to focus our efforts, not on staggeringly misguided ideas about filling our schools with firearms,” the unions’ statement says. While policymakers engage in their own showdown, the educators and school employees in attendance seemed interested in what they individually could do. “[Schools] are starting to realize that, yes, we have safety procedures, but a lot of them are outdated and a lot of schools probably need to re-evaluate,” says Tiffany Parry, a teacher at Jordan High School in Sandy. She points out that the oft-drilled “lockdown” protocol of having teachers lock their classrooms and hide their children doesn’t help her dance class much. “My classroom is the first one by the main entrance of the school, and I teach dance, so we don’t have desks or anything. Even if we go into a corner, anyone could see us,” Parry says. David Burnell, founder of local tactical operations and defense school OpsGear, taught a session on how individuals can respond to a mass shooter. Burnell, a U.S. Air Force and Special Operations “Cold Warrior” who in 2010 protected Utah doctors doing relief work in the aftermath of the Haiti earthquake, mixed serious information with snappy one-liners in his presentation. He advised dog-piling an assailant and filling a sock with batteries to create, MacGyver style, an impromptu defensive weapon and referred people to the Department of Homeland Security’s “Run, Hide, Fight” YouTube video. Burnell also emphasized that the best weapon beyond anything—even a gun—is being mentally prepared to react to violence. While Burnell was self-deprecating about some of his own “knuckle- dragger” reasoning, he also argued that every teacher can react in his or her own way to violations of their moral codes. It’s a message that resonated with Richard Summers, a sixth-grade teacher at Copper Hills Elementary in Magna, who says his students recently asked what he would do if there were a threat to the school. He says that giving his life was the easy answer, but now he may have better tools for prevention. “There’s something about being a schoolteacher—you love your kids and want to make sure they’re safe, no matter what,” Summers says. But trainers acknowledged that a weapon, even in the hands of one competently trained, won’t necessarily provide a fix to every scenario. An elderly Davis School District bus driver asked about responding to a threat on a bus. Burnell, who has experience in hostage-rescue scenarios, says those situations are incredibly challenging for tactical experts, let alone an average citizen. Marguerita Davilla-Tlck, who works at the front desk of Matheson Junior High in Magna, says she doesn’t own a gun and doesn’t plan on buying one. The last time she held a gun was 35 years ago, when she fired off a .22 pistol in Emigration Canyon and almost got knocked off her feet. “I didn’t like the feel of it, I didn’t like the sensation of it, and I’ve shied away from guns ever since,” Davilla-Tlck says. “And I still don’t believe guns are necessarily the answer.” Still, she liked the class, particularly the idea discussed at one point of using a can of hornet spray against a would-be mass shooter. Her objective, she says, was education. “A lot of teachers are liberals, so you’re not going to see a lot of gun-happy people running around in the schools,” she says. “But on the other hand, our world is changing, and we’re faced with making difficult decisions quickly in trying to protect our kids. In April, 45 senators cowardly ignored the will of the American people in favor of special interests. There is nothing more frustrating than trying to reason with someone who has made up their mind and is also convinced of their own moral superiority.